This summer has been one to remember. We have had some very good fishing days and I’m getting really excited about this fall. 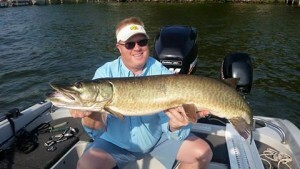 The Walleye and Crappie fishing is going to be fantastic and the Muskie fishing should also be pretty good. This winter we have a new 8×20 Wheel House. Prices not set yet but this baby is nice. Pictures and details will be released soon. We appreciate all the support and I look forward to fishing with you down the road. Have a great summer folks. This entry was posted in Fishing Report on July 30, 2015 by Kevan Paul. Happy Independence day! The summer has arrived and the typical fishing has also. The Muskie Fishing has been the most attractive fish to target but we have also been catching a pile of Yellow bass. The Walleye fishing has been up and down. Yesterday we caught a couple night fish but if the weather and boat traffic cooperate I think we could do well. If your going to be in the Clear Lake area this summer and you would like to get out please give us a call. We have some different options like the Muskie fishing or Yellow Bass / Walleye. We also fish a couple other bodies of water and catch panfish / large mouth. We offer dock pick-up for all you lake home renters or lake home owners. This makes my service very simple. I show up with all the equipment and you guys/gals jump in and we will have a good time. This summer if your looking for something a little different please give me a call you won’t be disappointed. Trips are 4 or 7 hours. Fish cleaning is also available. 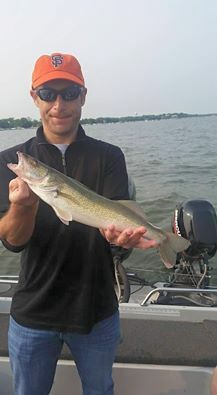 This entry was posted in Fishing Report on July 6, 2015 by Kevan Paul.